New here. couldn't find a solution for my problem...i thought ask you guys. I've 1996 civic hx 187XXX miles. I had to jump the car 2 weeks ago cause the battery was dead. After i started the car....the heater/AC stoped blowing the Air from the front middle panel....the air is coming out from the left and right hand side little panel, and also from the feet area. Does the mode control motor operate at all? For example, does it switch properly to defrost or other modes? you know what ive foumnd out...that is working with the windshield defrost mode ...not with its actual mode. I too had to jump my 96 civic (battery died). New battery installed and now like the guy said, my mode control has been reversed. The motor is fine, it steps thru all five positions as the buttons are pushed, it just is backwards now. If I want defrost air, I push upper vent. If I want upper vent, I push defrost. The floor vent is correct, being in the center, but on both sides the positions are reversed, i.e. the motor goes the wrong way. How can I reset or is the motor hosed from the jumpstart. I don't know if the good samaritan hooked the cables up backward momentarily or not, I was just grateful he had cables and the kindness to help me out. Anyway, I can live with this, I just have to remember if I want the function of the rightmost button, I push the leftmost button. If I want the function of the second button on the left, I push the second button on the right. At least the center button is correct with the vent door position. Strange problem!! I would try to disconnect the battery for a minute or two to see if that will clear the problem. I highly doubt that he reverse the polarity from the jumpstart. You would have a bigger problem than the one you have now. Strange, I had the same issue on my car with a very similar situation. The problem is that I still haven't fixed it, still looking for a solution. I have a 96 honda civic EX and about 2 years ago i went to start my car and the battery was dead, that night the heater vents were all messed up and have been since. If I want defrost, i select front vent. If i want front vent, i select defrost. The same applies to front vent/foot and front vent/defrost. Just foot button has not been affected. I have tried to figure this out and there isn't much info on it. 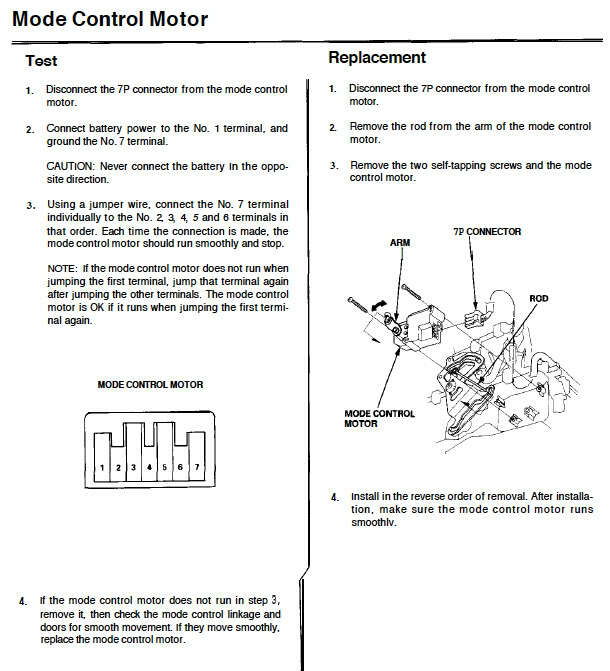 But after reading this I will be checking out the mode control motor. My question is how to tell if it is bad? Technically it still works in the sense that it does change which vents it is blown to, just not the correct ones. Should I be looking for some electrical issue or just a bad motor? The other interesting things is that ever since that night when my battery died, I have had battery issues every since. Alternator is fine, battery is fine, yet in winter it will die if it sits for one day. I always thought the two were connected, but no proof on anything yet. Would like to get to the root of the vent problem though. 1: start the car and push the defrost button and when the air is blowing in your face, shut the car, do not press any other buttons. That's it folks, you will be happy to see that the air comes from where it supposed too. The battery dieing just wondering if there's any electrical stuff not working in the doors... I.e. Windows, mirrors, powerlocks. If so it's common for the harnesses between the door and the body to break wires and cause a parasitic draw on the battery. Not hard to check just Google the procedure for finding the parasite. Hope this helps someone.... oh by the way I didn't look at the age of this post so if it's real old sorry... typed to much to change it now lol.